Animals have been a part of Tomi’s life from day 1. Tomi’s parent’s first 4-legged “child” was Suki, a small black mixed breed dog. Suki and Tomi were good friends throughout Tomi’s childhood. Suki lived to be 18 years old! Tomi grew up in Wyoming and was often seen around town riding Penny the mule. She was around a wide range of animals from cats and dogs to the more exotic, hermit crabs and parakeets. Tomi’s current pet is Ronald Norman Weasley, an orange tabby named after a Harry Potter character. Ronald has a huge personality and even has his own Instagram page! Tomi says she and Ronald had an instant connection at the Idaho Humane Society, when Ronald bumped noses with Tomi, that sealed the deal and she adopted him. Besides her love of animals, Tomi loves hiking in the foothills, cooking, reading, and volunteering in the community. She also loves anything Harry Potter! 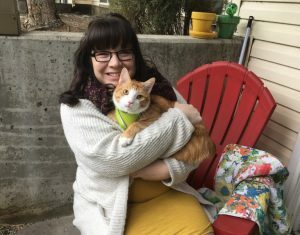 Working for The Pet Sitter of Boise allows Tomi to get her pet fix as having just one pet of her own does not seem like enough.